Reddit is a social networking and news website where registered users can submit contents to be voted "up" or "down" by other users, so that the contents' positions on the site are determined by their popularity. Content entries are organized by areas of interest called "subreddits." Reddit Gold is its premium membership program with extra features such as turning off ads as well as special benefits from gold partners for promotional products and services. The membership costs US$3.99/month, or US$29.99/year. You can also send a postcard for a free one-month Reddit Gold membership. Postcards 3579, sent to Reddit for a free one-month Reddit Gold membership, shows a parody photo made via Adobe's Photoshop from the Biggest Little City in the World sign in Reno, Nevada. 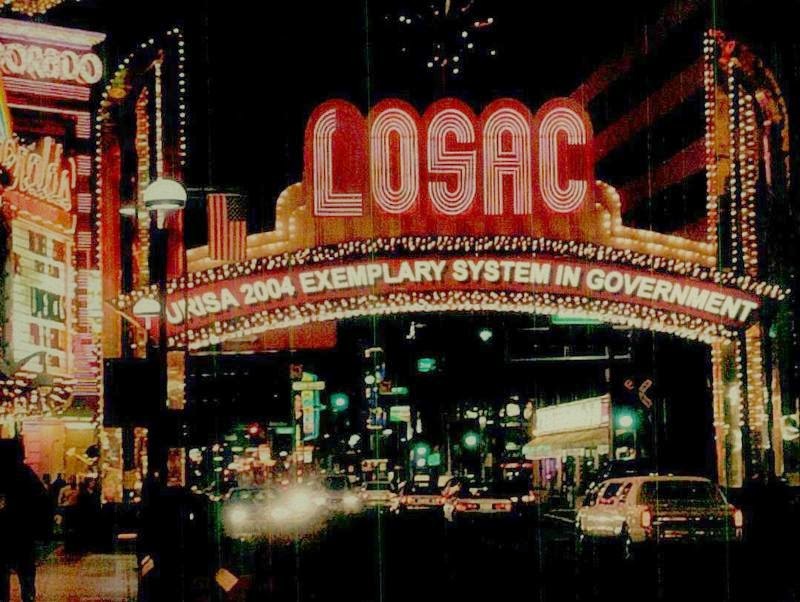 One of my projects LOSAC - Lake Okeechobee Stage-Area-Capacity System - won the 2004 Exemplary System in Government award at the 2004 URISA Annual Conference in Reno during November 7-10, 2004. The parody photo was used for the opening of a slide show introducing my project.